The Christmas tree is a must in every house or office. But, if the space does not allow too much, you can still have perfect, beautiful Chrismas tree. You can opt for a carefully arranged and packed by hand Christmas tree from our collection. With a perfect symmetrical form and the natural fir scent, this tree is bound to give you the right Christmas vibe. Its aspect integrates in any environment. You can order it online and then have it at home within two hours. It’s simple, effortless and free. All rights reserved S.C. Floria Network SRL © 2019. Trade Registry number: J40/1776/2013, Fiscal code: RO31225755, Social capital 2000 RON, $$ | Address Floria: Primaverii Blvd, no. 12, Postal code: 011974, , , . Phone: . Prices are updated daily and include VAT. Stocks are displayed in real time. Floria utilizeaza fisiere de tip cookie pentru a oferi o experienta de navigare cat mai buna, prin personalizarea continutului Floria si a anunturilor pe care le afiseaza, pentru a dezvolta functii noi social media si pentru a analiza traficul website-ului. De asemenea, Floria ofera aceste date partenerilor sai (retele sociale, de analiza a infromatiilor, de publicitate) care le pot combina cu alte informatii obtinute de ei direct sau indirect. 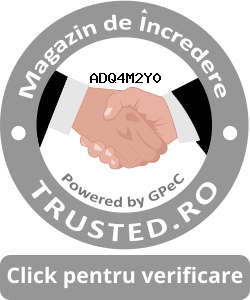 Prin continuarea navigarii pe website-ul nostru, sunteti de acord cu utilizarea modulelor noastre cookie. Cookies support the website usability, by activating base functions, such as navigation and access to secured areas of the website. The website cannot optimal function without these cookies. Experiments - Is used to show a different type of content to improve the user experience. Marketing cookies are used to follow users from one site to another. The whole idea is to show relevant announces to individual users, so this insight is relevant to advertising agencies and third parties that provide advertising services.